What types of things do you find yourself making most often? This is something I've been thinking about lately. As a crafter, I usually find myself making things for my home, my daughter, friends or relatives, and myself, in that order. 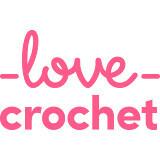 As a crocheter, I gravitate toward big projects - blankets, mainly - and I tend to think of myself as mostly a blanket-maker, though I enjoy branching out into home decor and wearable items, especially for gift-giving. I've been thinking that most wearable things I've made have been for girls and women, but there are plenty of things to crochet for male people when you look around. I've been doing that lately, as I'd like to make more things for the people in my life. I went looking recently for ideas to make something for my dad, who has a birthday coming up. He's a man who has many different kinds of interests, a few of which really border on passions, so I've often tried to find books, games or music media to help with his collections on the topics he likes. I seem to have exhausted a couple of them lately through birthday and Father's Day presents; he's read all the books or owns all the CD's, you know how it is. So I decided to make him something instead. I thought about a scarf; he lives in a place with long, cold winters, and a scarf would be useful. And I owe him a scarf anyway. When I was still in college and living at home, I started crocheting a scarf for him and ran out of yarn before it was nearly long enough; I wasn't much of a crafter yet, but I liked the idea. That was about eighteen years ago, and it seemed like time to make it up to him. A do-over, if you will. I searched Ravelry for something a little different, that would be nice for a man without being too bulky (I don't love crocheting with thick yarn, and he doesn't like bulky things). I came across The Granite Scarf from a blog called The Caped Crocheter (also found as a free Ravelry pattern here). It's categorized as a "men's scarf," but it would work for anyone. I loved the look of it and decided it was just what I wanted. I really enjoyed making this scarf! I used yarn from my stash, a basic worsted acrylic yarn for softness and ease of care, and I just kept crocheting until it was gone (I had about two feet left when I stopped). The pattern utilizes a stitch I'd never tried before - the extended single crochet. Have you tried this? It makes such an interesting design. I hope you can see about how the stitches sort of reach down into the row beneath them, almost like the Larksfoot stitch pattern I used in a blanket I named Hensfoot a couple of years ago. Another interesting thing about this stitch is that it almost makes a double-layered fabric, sort of like a thermal weave. I think it will be warm, soft and comfortable to wear. I considering adding fringes, after seeing some nice examples in the pattern projects, but I don't think he's really a fringes kind of guy, so I just did the ends as the pattern suggested. I like the neatness of them, just a row of regular SC with an additional row of slip stitches to finish off, just simple and clean. Even though it feels a little thicker due to the stitch pattern, it's still flexible, with a nice drape. It's not necessarily "manly" (whatever that would even mean), which I appreciate. It's just simple and tailored, anyone could wear it. If you look through the projects on Ravelry for this scarf, you'll see that people have made it with all kinds of yarns, both masculine and feminine in style, and it looks great no matter what they've used. I'm really glad I found this pattern. I've long had a go-to scarf for women in my life - the fantastic One-Skein Chevron Scarf, of which I've made about nine. But I haven't made very many scarves for men, so this beautiful, easy Granite Scarf will definitely become another go-to pattern in my library. I hope he likes his scarf and that he will be glad I finally followed through! The scarf is lovely such a pretty colour. It is always more difficult to find present ideas for men. I am sure your Father will love your made with love gift. 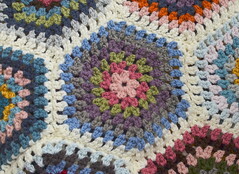 I am making some wash cloths at the moment for gifts with some soap and a cushion cover next. That looks like a perfect scarf for a man. I have never used that stitch so I think I will add the pattern to my Ravelry library and make one. It will reside in my gift closet until the perfect person needs it. :-) Maybe Alex for Christmas. Thank you for sharing with us. Great gift idea. It does look manly. It's very nice! I love the color and I know your Dad will love that you made it for him. That is a great gift idea, I don't think I have ever come across that stitch before. 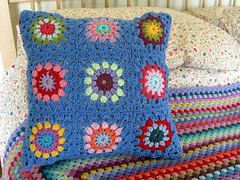 Blankets/throws seem to be my most popular go to crochet project. It's lovely. An interesting stitch which I haven't used before. I think it's really hard thinking of gift ideas for men so it's good to have a go to pattern like this. I love the shad of blue you used for this scarf and the stitching. Really great work! Thanks for the share, have a fantastic rest of your week. Keep up the posts! How nice! He's going to LOVE that! What a kind gift.